On July 15, I went on a photo walk in Fresno’s historic Chinatown with my friend and colleague Kelley Campos McCoy, who teaches journalism at Fresno State. It was my first photo walk, and I posted the photos to my Facebook profile. I’ll work on getting a slideshow put up here on the website sometime this week, so my non-Facebook readers can see the results. Early in the walk, I met a young man named Agustín Pérez outside the Buddhist temple. He was eating a pork burrito that he’d bought at April Meat Market across the street. Agustín seemed lonely and he was eager to talk. We muddled through a conversation in his broken English and my broken Spanish. Agustín said he had been working in the fields but that he had the day off. He said he had no address or phone number for me to contact him. 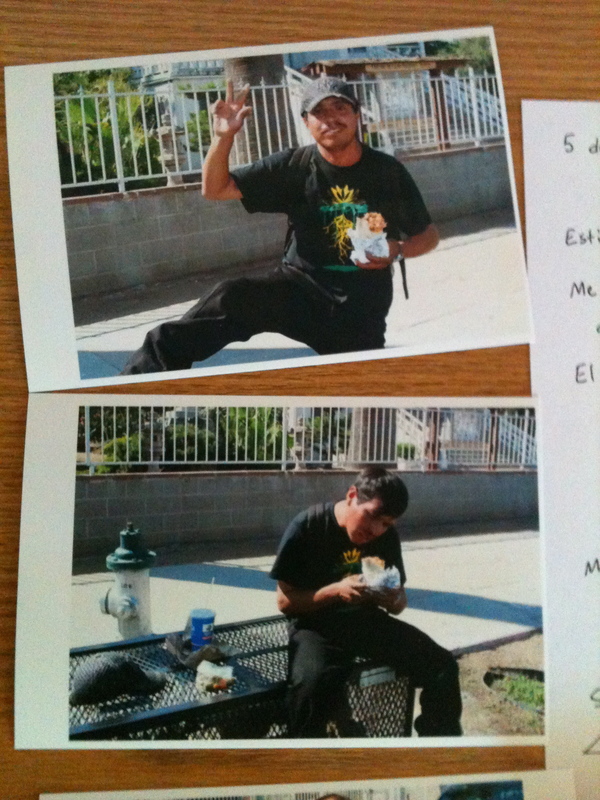 Agustín asked me to take a photo of him outside the temple and a photo of him eating and send them to his father and mother in Guatemala. He also asked me to send them ten dollars. I wrote down his family’s address and agreed to do it. It took a little while for me to take note of the correct address details for Agustín’s parents. I wanted to make sure and get it right. The address Agustín gave me did not have any house numbers or postal codes. He said that was accurate. 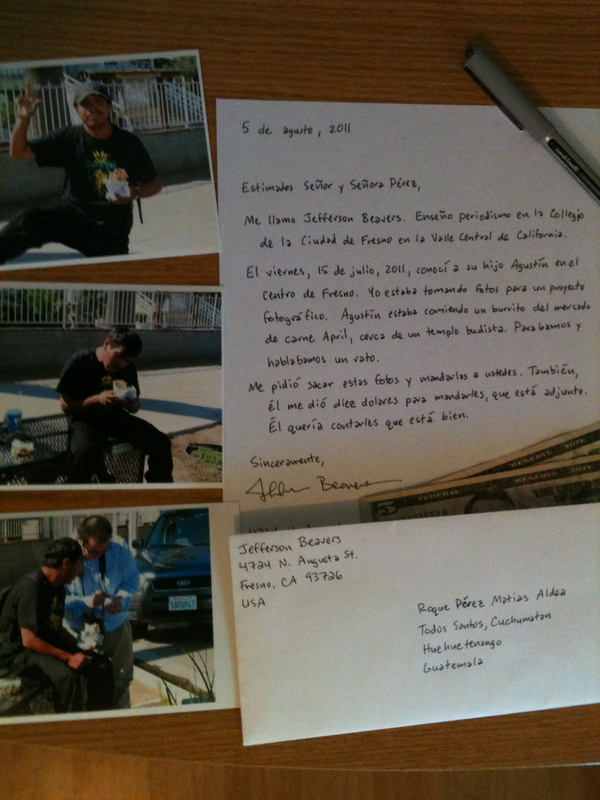 The letter will simply be addressed to his father, Roque Pérez Matias Aldea, in the city of Todos Santos, Cuchumatán, in the Huehuetenango province of Guatemala. 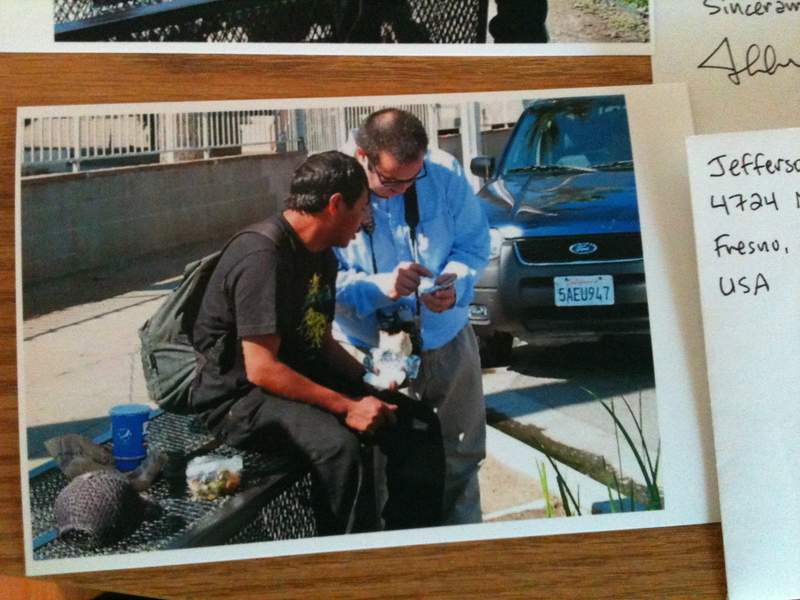 Kelley took a photo of the two of us talking, as I diligently entered notes on Agustín’s address into my iPhone. I did some research on Agustín’s hometown by Googling parts of his address. I found an informational website put together by Professor Robert Sitler of Stetson University in Florida. The site details the basics of language and culture in the mountainous municipality of Todos Santos in northwestern Guatemala. I then asked my good friend Rebecca Plevin, who writes about health and environmental issues in the Latino community for Vida en el valle newspaper, to help translate my short letter to Agustín’s parents. As Rebecca and I checked out Prof. Sitler’s website, we realized that a letter in Spanish might not work for a community that mostly speaks Mam, a Mayan dialect! But it was the best we could do. Here is my original letter, in English. My name is Jefferson Beavers. I teach journalism at Fresno City College in central California. On Friday, July 15, 2011, I met your son Agustín in downtown Fresno. I was taking pictures for a photography project. Agustín was eating a burrito from April Meat Market, near the Buddhist temple. We stopped and talked for a while. He asked me to take these photos and send them to you. He also gave me ten dollars to send to you, which is enclosed. He wanted me to tell you that he was doing well. Although it has taken me several weeks to pull together all the pieces — writing the letter, getting the translation, and printing out the photos — I am going this morning to the post office to send the letter. I do feel bad that it has taken me a little while, because as I’ve thought about my short meeting with Agustín, I realize that his request of me was actually quite urgent and important. He wanted to let his parents know that he was alive, happy, and eating well. He also wanted to send them what money he could in that moment. I’m sending this letter to Mr. and Mrs. Pérez with great faith that it will reach them, and I hope their son is still doing OK.
What a great story and very kind thing for you to do. Wouldn’t it be great to receive a letter back from his parents?